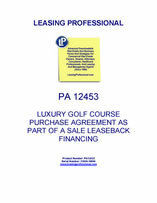 This Purchase Agreement is for the all cash sale of a golf course and country club. Prior to the sale, the country club has been operated by the seller, who owns the land and buildings constituting the golf course, and by an affiliated management company. 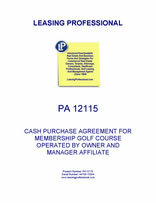 The country club has private members, who will remain after the sale. The sale includes all the land, buildings, facilities and liquor license, all personal property and furniture, fixtures and equipment, together with other intangible property related to the county club operations.